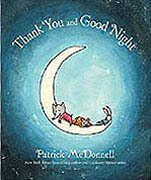 Thank You and Good Night: Patrick McDonnell's first bedtime book captures the magic of a sleepover with friends, and reminds us to cherish life's simplest pleasures. During a fun pajama party, three animal friends dance and play, but at last everyone is getting sleepy. Is it time for bed yet? Not before taking the time to say thank you for the day, the night, and good friends. Haardcover. Picture Book. Ages 1 - 3. Wag! What makes Earl's tail wag? Mooch says, "I Know! I Know!" 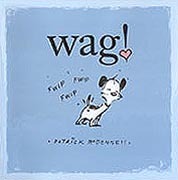 In this tale of tails, Patrick McDonnell celebrates wiggling and waggling, swishing and sweeping, fwipping and fwapping.... and every dog's secret to the joy in life. Hardcover. Picture Book. Ages 6 - 7. Just Like Heaven: One misty day, a fog creeps in on little cat feet. But Mooch, having awakened from a nap, is mystified. Where could he be? Maybe... In heaven? 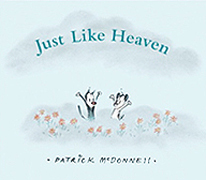 But heaaven, it seems, sure looks a lot like home.... Join Mooch the cat and Patrick McDonnell on a peaceful journey that savors every day's simple delights. 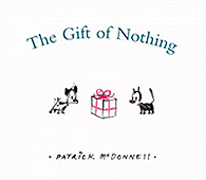 Gift of Nothing: It's a special day, and Mooch wants to give his best friend, Earl a gift. But what do you get someone who has everything? Join Mooch as he searches high and low for... the gift of nothing!. 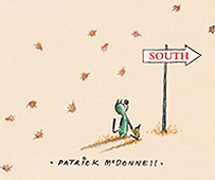 South: As the last of the autumn leaves gently fall, Mooch the cat helps a lost little bird on a journey. A journey of compassion, a journey of friendship, and a journey home. 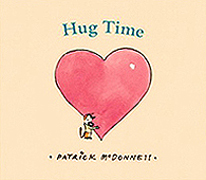 Join them on their journey as you turn the pages of this delightful wordless picture book. Cat-in-Bed Finger Puppet: This 4" finger puppet is ready for a busy day! Who knew it would find so many things to do and see. Before long it's ready for a nap! Plush Black and White Cat: A mischievious little cat will enjoy sharing a cupcake with you. 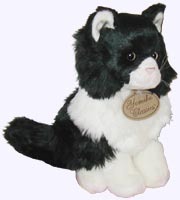 This Black and White Cat stands 9" tall and is surface washable.